Paul’s instruction for us to look not upon “things that are seen” but rather upon “things that are not seen” has been the anchor truth for many of the glimpses I have received into God’s grace. How can one actually see things that are not seeable? Jesus said, “Let those who have eyes to see, see.” It is obvious that He was not speaking of physical eyesight. There is one invisible truth that, in this writer’s mind, stands above all others. It has everything to do with the interesting words found in Exodus 25:40. God told Moses to make sure that he built the tabernacle according to the special pattern that had been given to him on the mountain (Sinai). Why was this the case? A very familiar and dramatic moment in ancient Israel was when the high priest entered a small room in the tabernacle called the Holy of Holies. He did this once every year carrying blood to sprinkle on the solid gold plate on top which was called “the mercy seat” (Heb. 9:7). Under the mercy seat inside the ark were three seemingly insignificant articles: a pot containing fragments of manna, Aaron’s rod that had budded, and shards of broken tablets of the Ten Commandments. These objects represented Israel’s rebellion against God. Shortly after the Exodus, the Jews revolted against God’s provision of food (the manna), against God’s leadership (the rod), and against God’s law (the Ten Commandments). The people had sinned against God. Replicas of two cherubim were positioned at either end of the ark representing God’s righteousness and His justice. They symbolically looked down upon the mercy seat and at the objects revealing the sin. The wages of sin before a holy God was death. But the blood carried by the high priest was spread upon the mercy seat, satisfying God’s righteous demand against the sin of the people for one year. It is very important to realize that the High Priest entered that little room alone, out of all human sight. (Heb. 9:7). Enter Jesus Christ, our great High Priest, who appeared in the presence of God in heaven, far away from the probing eyes of all human creation. Christ came as High Priest of a tabernacle not made with human hands (Heb. 9:11-12). This was the real tabernacle in heaven from which the earthly pattern was taken (Ex. 25:40). It was into this heavenly tabernacle that Christ entered the Most Holy Place once for all, obtaining eternal redemption. Christ never once entered the physical earthly tabernacle made with hands, but He went into heaven itself to appear in the presence of God for us. After He made one (heavenly) sacrifice for sins, forever, He sat down at the right hand of the Father. It is from this vantage point that He is waiting for His enemies to become His footstool. It is fascinating that at the foot of the cross upon Mt. Calvary many eyes were looking intently at a man dying there. It is here that Paul’s unseen truth comes into crystal clear focus. In heaven, out of the sight of any human eye, our High Priest was Himself becoming sin for us. He was performing His work before the real mercy seat of God. The word that sums this all up is the word propitiation. It means “satisfactory sacrifice.” Jesus Christ and His heavenly service was indeed the final forever sacrifice for our sin. What can we add to that? For a more detailed look at Propitiation, go to the article on our web page. Many friends and I have been grieving the death of a college classmate recently. She and I were freshmen together. I looked forward to meeting her along with others at a local restaurant for coffee. I was aware that she was in the building because of her laugh. What a laugh it was! When she laughed, she really laughed. And it was contagious. Others seemed to catch it and laugh with her. She lived her life with eternity in mind, especially during the last couple of years when she endured much suffering. She will be missed. I could not help but think of her when I penned these words. During His ministry on earth Jesus, the God-Man, demonstrated His amazing power over nature, angels, disease, demons, and death itself. Amazingly, He raised three people from the dead: the widow of Nain’s son (Lk. 7:14), Jarius’ daughter (Matt. 9:25), and probably his most famous resurrection was that of Lazarus (John 11:1-27). Lazarus never said a word, but his story is still speaking around the world today. His testimony begins in the little town of Bethany. It was located about two miles from Jerusalem where Jesus was staying. Jesus received word that Lazarus, a dear friend, was sick. Lazarus’ sisters, Mary and Martha, had sent word to Jesus, possibly thinking that Jesus would come right away. Instead, Jesus sent word that Lazarus was not going to die but that his sickness was to shed light upon the Son of God. The text clearly says that Jesus loved all three of these siblings: Lazarus, Mary, and Martha. But He waited in Jerusalem two more days. Two more days! Why? It is simple. He waited for Lazarus to die. When He was at last ready to depart for Bethany, He told His disciples that Lazarus was asleep and it was time to go and wake Him up. The disciples’ response was understandable. Sick people need rest and it’s good that he is asleep. It is obvious that they were not yet tuned in. Then Jesus rocked them by announcing that Lazarus was dead. Dead! But He quickly followed up with these incredible words. “And I am glad for your sakes that I was not there, that you may believe. Nevertheless, let us go to Him” (John 11:15). Lazarus is dead and the Lord is glad? I can’t begin to imagine how these men must have responded to these words. “That you may believe” was possibly lost in the moment. When Jesus arrived on the scene, He discovered that Lazarus had been dead four days. Four days! I’ve often wondered what went through Mary and Martha’s minds during this time. Where is He? Why doesn’t He come? Does He really care for us? He did so many wonderful things for so many people, why not us? They must have had a myriad of thoughts, and some of them not good. And He was only two miles away! Then comes the majestic moment. Jesus met Martha face to face. The air must have been ripe with emotion. Martha’s cried, “Lord if you had been here my brother would not have died.” It’s hard to know how her words came out and what she was really thinking. She followed up quickly by saying that God may yet do something. I am awed when I think of the truth of these words: “He who lives and believes in me will never die.” Believers that die go instantly into the presence of Jesus Christ. For us nothing comes between leaving this world and entering the next. We do not die! The very millisecond that this physical life ends, we are face to face with Christ. We are absent from the body and present with the Lord. Halleluiah! The supernatural moment finally came. Jesus asked those around to move the stone away from the grave! Hold it! Lazarus had been dead too long! His body was already a stench. “Move it away,” Jesus commanded. They obeyed. Then Jesus spoke boldly, “Lazarus, come forth.” He wasn’t saying it loudly for Lazarus to hear. After all, He was the One who spoke all of creation into existence. He was the One who breathed life into Adam. He was the One who said, let there be, and it was. No! He wanted all those standing around to hear. He wants us now to hear. He wants those who read this who are spiritually dead in their sins to hear. Lazarus immediately obeyed His command. 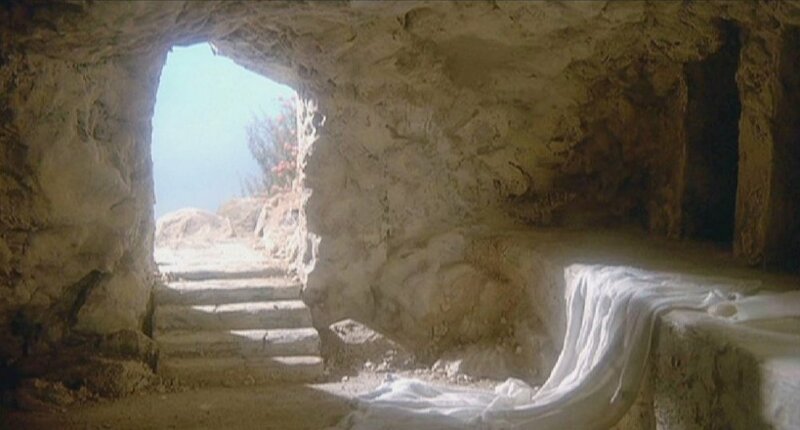 The one who was dead came to life and walked out of that tomb. Our Lord’s words, Lazarus come forth, shout to us now and continue to reverberate down thought the corridors of human history. Jesus said that He was glad for “your sakes that you may believe.” Believe what! Believe that only God can give life to the dead. Jesus Christ is God, and only He can give you life. “And this is the record that God has given to us eternal life and this life is in His Son. He who has the Son has life” (1 John 5:11). Do you believe this? One o f the oldest productive grapevines in the world is said to be located at Valentines Park in Essex, England. It is thought to have been planted around 1768. In 1800 its girth was approximately one foot. The crop of grapes is usually harvested in September and it takes the vine keeper around three weeks to remove all the grapes – about 500 to 700 pounds. Incredibly, the branches extend out over 120 feet. Life has to flow a long way through the vine to the small branches in order to make the fruit. In like manner for Christians, life has to flow from the source to the branches in order to produce fruit pleasing to God. Jesus declared himself to be the True Vine (John 15:1-8). God referred to Israel as the vine (Psa. 80:7; Isa. 5:1-7), but Israel failed to produce the fruit that God intended. The Lord Jesus is succeeding where Israel failed. The Father is presented as the vinedresser. He is the ultimate giver of life. 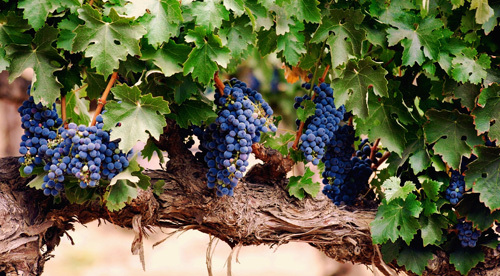 Unless the disciples misunderstand the metaphor, Jesus gave them comfort by quickly affirming their never ending connection to the vine (John 15:3). Jesus refers to Himself as the Vine and His followers as branches. The symbolism is clear. Christ’s disciples are like branches connected to the life-giving vine, Christ. Unless the branch abides in the Vine, the life from the branch will not flow through it. His spiritual life flows from Him then out through those who belong to Him. We cannot produce anything of spiritual value to others without the life of Jesus Christ flowing through us (John 15:5). The Father removes every branch that is not productive. This would indicate that the branch is dead (Judas Iscariot comes to mind). He then prunes the branches that are productive so that they will be even more productive. This pruning involves chastening and scourging every son whom He receives (Heb. 12:5-10). This process ends by producing the peaceable fruit of righteousness to those who have been trained by it (Heb. 12:11). Fruitfulness is the big idea of this metaphor. The quality and quantity of the fruit is not the issue here. Fruit will come from the flow of life coming from the vine (Christ), then out through the branches (disciples). Therefore, the branches must abide in the vine. Abiding involves maintaining a close, personal, private, intimate relationship with Jesus Christ (vs. 9). Jesus said that if His words abide in them (the disciples), their prayer life will also be enhanced. I take this literally. It is a good idea to spend time memorizing the words of Christ, filling our minds with them. The metaphor crescendos by teaching that “much fruit” produced glorifies the Father. The word “glorify” means to shed light upon. The spiritual fruit that disciples produce by abiding in the vine sheds light upon the invisible God so that others may come to know Him. So shall we be His disciples. The hungry crowd was astounded at what had happened right in front of their eyes. Twelve men had suddenly become waiters in a wasteland, carrying basket after basket of bread and fish, feeding a multitude of thousands. The food was inexplicably coming from a small boy’s lunch. What a miracle! At the center of it all was a man called Jesus. The crowd began to follow this remarkable stranger who had given them food like they had never had. Jesus knew what they were thinking, and told them that they were seeking Him not because of the enormous miracle He had performed but because they were hungry and had been fed. He instructed them not to strive for physical food that could bring only temporary satisfaction but for the fare that He could give – everlasting life. They understandingly asked Him for another sign (hopefully one that would end in another meal). Jesus reminded them of a time long ago when their forefathers were trapped in a vast wilderness with nothing to eat. He told them how God had supernaturally rained down upon them bread from heaven (the manna). He then gave them this glimpse of His grace. He said, “I am the bread of life.” The manna was symbolic of Him. He was the real bread of life that the Father had given. Whoever would come to Him would never hunger and whoever believed in Him would never thirst. Wow! Note the powerful words then spoken by the greatest communicator who ever lived. “All that the Father gives Me will come to Me and the one who comes to Me I will by no means cast out” (John 6:37). I have pondered the depth of these words numerous times. First came the giving and then the coming. The meaning is magnanimous! I did not come to Him because I stumbled across the marvelous gospel given in a clear way, nor because I had the good sense to believe the gospel when I heard it, and not even because I had the discernment to place my trust in Jesus Christ. No! I came to Jesus Christ because of a transaction that took place long before I was ever here. God the Father gave me to Christ. I received the gift of God’s grace because I am a gift of God’s grace. Praise Him! God orchestrated my whole salvation experience: the hearing the gospel, the understanding that came, and the trust that I placed in Christ. No theologian can spin the sense and dull the significance of the God-Man’s words. His words rocked my world and forever changed my life. And not only this, but He continued. “For I have come down from heaven not to do my own will but the will of Him who sent Me. This is the will of the Father who sent Me that of all that He has given Me I should lose nothing, but should raise it up in the last day” (John 6:38-39). My salvation and my eternal security were wrapped up tight in the mind of God long before I was ever here. It was His will that made the eternal difference for me, not mine. “And this is the will of Him who sent Me that everyone who sees the Son and believes in Him may have everlasting life, and I will raise him up at the last day (John 6:40). So what is my invitation when I give the gospel today? It remains, “Believe on the Lord Jesus Christ and you will be saved” and “Whosoever will may come.” But I always pray that there may be some “gifts” in the audience. “O taste and see that the Lord is good” (Psalm 34:8). No teaching in scripture gives more insight into the identity and work of Jesus Christ than His seven uses of “I Am.” Jesus said, “I am the light of the world. He who follows Me shall not walk in darkness, but have the light of life” (John 8:12). Jesus referred to Himself as the light of the world shortly after a woman had been caught in a public scandalous affair. A crowd had gathered around her saying that according to the law she should be stoned immediately. Jesus, kneeling close to her and writing in the dirt, was quiet and His actions silenced the crowd. He broke the silence by asking the one who had no sin to cast the first stone, and then He continued writing in the dirt. Life comes from light. No light, no life. Recall John’s words in 1 John 1:5: God is light and in Him is no darkness at all. Jesus Christ as the light of the world is the giver of life. It was not mere chance that the first act of creation was light, and the Giver of that light was the second person of the trinity, the Lord Jesus Christ (Gen. 1:3). All living things – physical and spiritual – come from that light. John wrote, “In the beginning was the word and the word was with God and the word was God. The same was in the beginning with God. All things were made by Him, and without Him was not anything made that was made. In Him was light and the light was the life of men” (John 1:1-4). Wow! Jesus again referred to Himself as the light of the world in John 9:5: “As long as I am in the world, I am the light of the world.” A man who had been blind from birth had never seen the light of day or anyone. Strangely, Jesus spat on the ground and made a paste that He put on the man’s eyes. He then instructed the man to wash in the pool of Siloam. This meant that the man had to walk away from Christ and find the location. He did as he was instructed and was immediately given his sight. But Jesus was not there. He did not see the One who had healed him. He began to look for Christ. Don’t miss the reason for the miracle! He began to search for the One who had given him sight. He eventually found Christ and believed in Him (John 9:35-38). The lesson is clear for those who have eyes to see. The light of the world can remove spiritual blindness and give light and life. Wow! 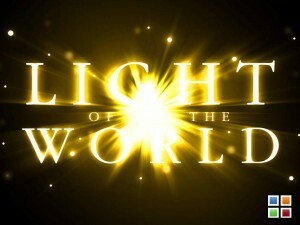 Finally, note that Jesus said while He was in the world, He was the light of the world. He is no longer here in person. Does this mean there is no spiritual light in the world today? We find the answer in Jesus’s words in Matthew 5:14-16 and Paul’s words in Ephesians 5:8. Jesus told His disciples, “You are the light of the world. A city that is set on a hill cannot be hidden. Nor do they light a lamp and put it under a basket, but on a lampstand, and it gives light to all who are in the house. Let your light so shine before men, that they may see your good works and glorify your Father in heaven.” Paul wrote, “For you were once darkness, but now you are light in the Lord. Walk as children of light.” Believers become the light bearers in the world today. We are to share the light of the gospel. Amazing!